I’d be weirded out if Amelie was also a blogger. 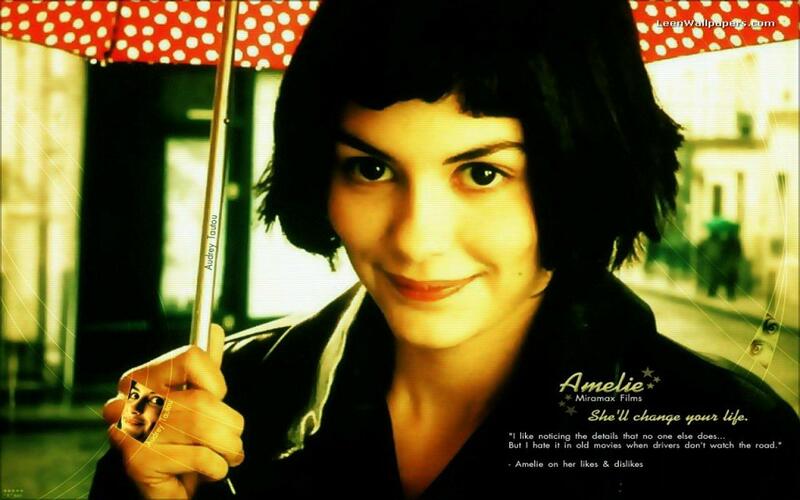 This is my review of Amelie/Le Fabuleux Destin d’Amelie Poulain! After having lived through a quirky childhood with her eccentric, neurotic parents, Amelie Poulain grows up to be a shy, self-isolating waitress whose life changes when she stumbles upon a memorabilia that belongs to a man who lived in her apartment in the 1950’s. After she returns it to him, she makes it her mission to help others by finding their lost stuff and giving it back to them, all while coping with her own inability to form connections with others. Guys and gals, this is going to be a tough review. A lot of people really like this movie, or at the very least respect it. I’m going to review this with as much charity to the fans of Amelie as possible, but at the end of the day, I have to be honest. This film is definitely an acquired taste and I tried really hard to get sucked into the whacky and whimsical world of Amelie, but I had some issues with it. As always, though, I’ll start with the positive. As a character study, Amelie succeeds. This movie is gung-ho about making sure that you know Amelie Poulain as intimately as the filmmakers do. Thanks to competent writing, everything about her is well-established; I know her past, her likes and dislikes, her successes and failures, and most importantly, what motivates her. I really appreciate learning the smaller details about her, like how she likes feeling the smooth texture of market lima beans underneath her fingertips or how because her father only interacted with her during her monthly checkups, his hand on her shoulder made her heart skip aflutter (this was when she was a child). Little details like that can endear the character to the audience. Audrey Tatou is enchanting as Amelie. Innocent without being childish, aimless but still hardworking, Amelie’s desire to help others is the closest she can come to human connections without endangering her own inner walls. Interestingly, the movie makes Amelie unaware of these inner walls until she begins her humanitarian quest. Oblivious to just how lonely she is, she discovers herself with each new person she helps. The movie presents the topic of loneliness in a light-hearted, yet respectful manner. The narrator…ugh! I get that he has to spoon-feed us exposition about Raphael and Amandine Poulain (Ma and Pa), but when the story stops so that Mr. Narrator can summarize the backstory of every single character, whether they’re major or minor, it gets a little annoying. It’d be like going to check the mail and then the mailman stops you, a total stranger, so that he can spend an hour and a half telling you the story of how his great-grandfather owned a potato factory in Ireland which had to be closed down during the Great Famine of 1845 to 1852! This movie is OBSESSED with having yellow be the main color palate! It’s not so bad during the nighttime scenes, but when Amelie is walking around at work and the walls emanate an incessant yellow glow or when the yellow daylight casts down on Amelie as she heads for the market, it got pretty repetitive. As original as the story was, it felt a little too episodic. Amelie finds a box in a hole in her wall because–potatoes–then she returns it to Dominique Bretodeau. End of 1st story arch. Then Amelie comes across a blind guy because–banana–and escorts him to the Metro station while narrating the journey. She leaves him at the station and takes off. End of 2nd story arch. The story structure of Amelie could’ve used a little more polishing so that it could feel less like a charming television show and more like a feature length with a three-act structure. Overall, I think I would have liked this movie more if the narrator would’ve “zip it, lock it, put it in your pocket” and if the story wasn’t quite episodic. However I definitely understand why a lot of people like this movie. It has the charm and self-awareness that a modern-day fairy tale needs. If this movie is to you what Pan’s Labyrinth is to me (and by that, I mean it’s a movie that changes your outlook on storytelling and greatly inspires you every time you watch it), then kudos to you! If this is your cup of tea, then it’s fine by me. not going to mirror on you. I’m sorry, I’m not sure I understand your comment.